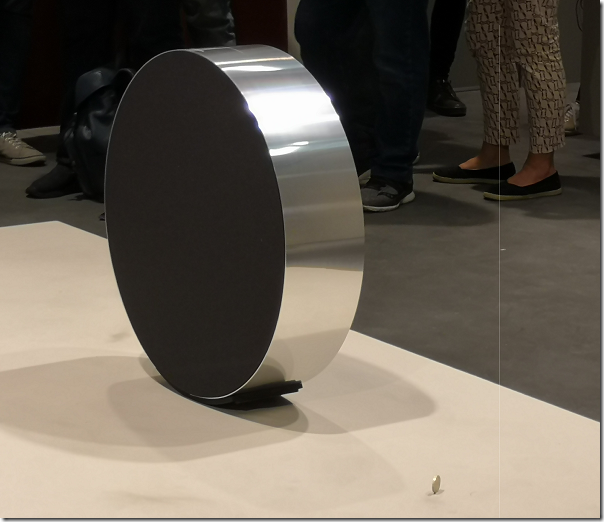 Bang & Olufsen (B&O) has a long history of innovative design; it has always been the brand to look for if you want an audio system that looks beautiful as well as delivering decent sound quality. 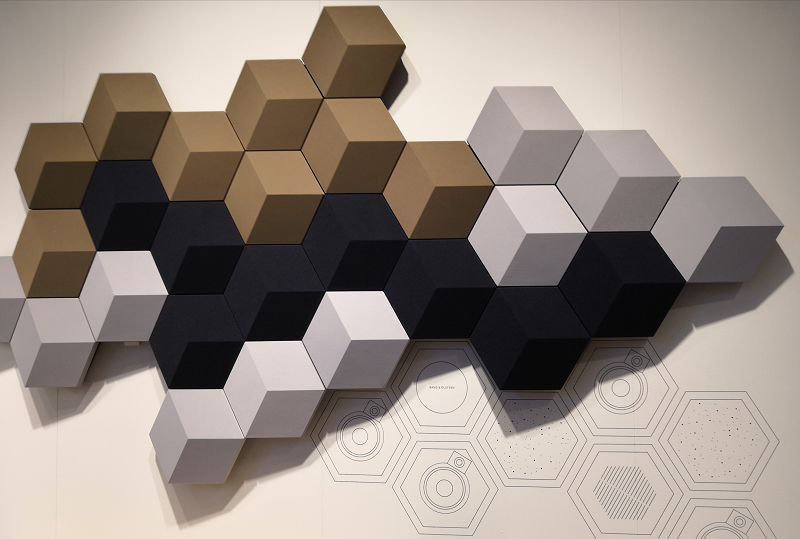 When I arrived at the B&O booth here at IFA in berlin the unusual Shape wall speakers caught my eye. This is as much art as audio and would be a talking point in any living room. Shape is not new though. The press briefing began with a cloth draped over something in the middle of the floor. The something turned out to be the Beosound Edge, a new design inspired, apparently, by the UK £1.00 coin. The presenter helpfully placed one of these alongside the speaker system. Of course we have now changed the design of our coin so it is no longer round, but never mind! The Edge is intended to be placed on the floor in the middle of a room, or it can be wall mounted. Inside the aluminium circle are 5 drivers: a 10" dual-coil woofer, two 4" midrange drivers, and two tweeters. These are driven by an active system, with an internal power amplifier providing 2 X 200w for the woofer and 4 x 100w for the midrange and tweeters. The midrange and tweeters are mounted back to back, so that sound emerges from both sides. It is an intriguing design, thanks to what B&O calls an Active Bass Port. 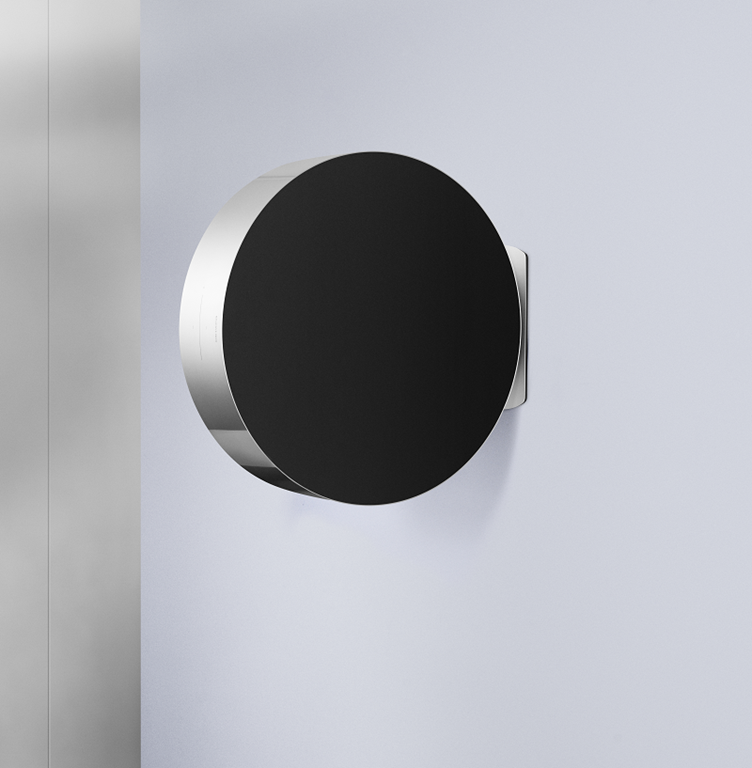 The idea is that at low volumes the speaker behaves like a sealed box unit, which B&O says gives a more precise sound. At higher volumes, a motorised flap in the port gradually opens, so it becomes a ported system. The image below catches the Active Bass Port in action. There are a few other smarts in the system. B&O has integrated the speaker with Google Assistant and Amazon Echo so you can do voice control if you feel so inclined. It also supports Google Chromecast, Bluetooth streaming, and DLNA DMR (Digital Media Player). You can also control the volume by rocking the speaker, one way to increase, the other to decrease. A Directional Sound Control allows you to tailor the sound coming out of each side. I am not 100% clear how this works, but you can for example designate one side for active listening, and the other for background listening. As you can imagine, a busy show floor is no place to evaluate hi-fi. However it still sounded great. When I first saw the Edge I imagined it would be bass-shy because of the relatively small dimensions of the cabinet, but this proved not to be the case. There is one thing that surprised me though. You cannot buy two of these and have stereo. Only a single speaker is supported, though B&O talks about “360 degree room filling sound”. The reason, I was told, is that all the electronic processing and feedback makes it difficult to synchronize the timing of two systems to obtain an accurate stereo image. This is being worked on though, and an automatic firmware update is planned which will enable stereo at some future date. You will be able to buy an Edge from mid-November this year. I am not sure that this is the best sound you can get for $3,500 but what I love about it is the combination of good sound, good looks, and innovation. Value cannot be judged on sound quality alone. The speaker measures 50.2cm diameter and 13cm width. €3,250 or $3,500. Available mid-November 2018. 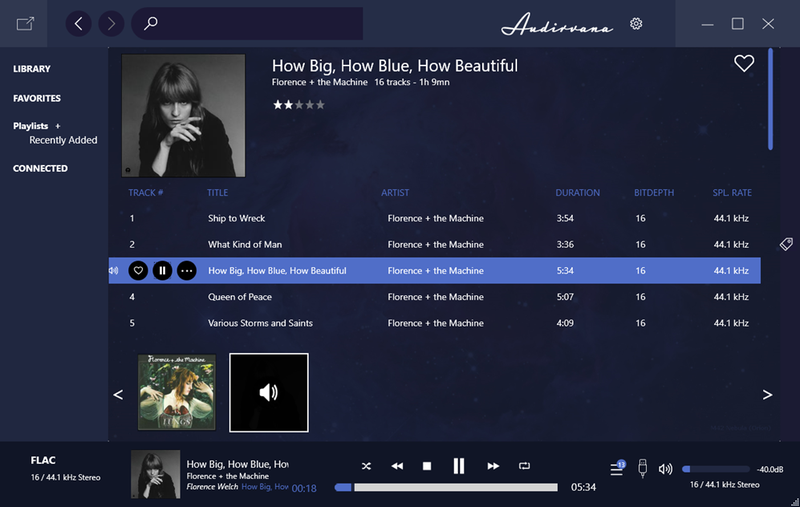 Audirvana Plus, an audiophile music player for the Mac, has now been released for Windows. Audirvana was developed in France by Damien Plisson, originally as an open source project (you can still get this here but it has not been updated since 2012). The description there still applies: “No equalizer, no trendy special effects, just the music”. 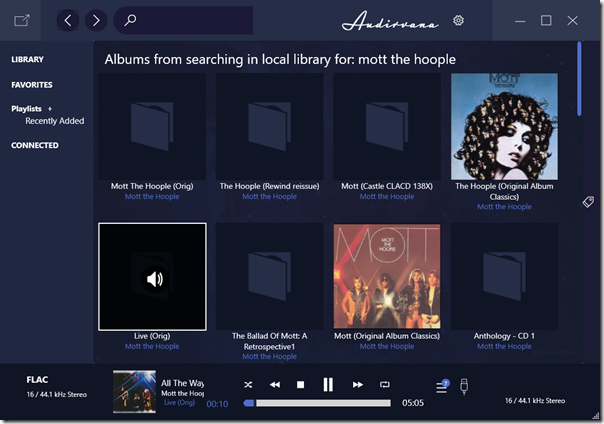 Both Mac and Windows come with music players bundled with the operating system – in Apple’s case the mighty iTunes – but the issue which Audirvana addresses is that these players are about convenience and features as well as sound quality. Another problem is that the sound system in a modern operating system is complex and needs to support every kind of application while from the user’s perspective it should “just work”; and this can mean compromises, such as resampling or normalizing the audio. This does not matter in most circumstances, but if you want the best possible sound and spend money on high-res downloads or streaming, for example, you want bit-perfect sound. This perhaps is a good reason not to play music directly from a PC or Mac; but the counter-argument is that using your existing computer reduces the box-count (and expense) of streaming, and that the flexibility and processing power of desktop computer is handy too. 1. Wide range of supported formats including AIFF, WAVE, AAC, MP3, FLAC, Monkey Audio APE, WavPack, Apple Lossless, DSD (DSDIFF including DST compressed, DSF, and SACD ISO images). DSD support works whether or not you have a DSD DAC. If you have a DSD DAC, you get full native DSD. If you do not, Audirvana will convert to hi-res PCM and it still sounds good. You can control how the DSD is converted in settings, such as the amount of gain to apply (without it, DSD files will sound quiet). 2. MQA unfolding whether or not you have an MQA DAC. The way this works is similar to DSD. If you have an MQA DAC, the decoding will take place in hardware. If you do not, Audirvana will process the MQA track in software. For example, I have a 16-bit, 44.1 kHz MQA-encoded FLAC that plays in Foobar 2000 as a 16/44 file, downloaded from here. In Audirvana though, the same file claims to be 24-bit/352.8 kHz track. That resolution is not genuine; but what matters is that MQA decoding is taking place. 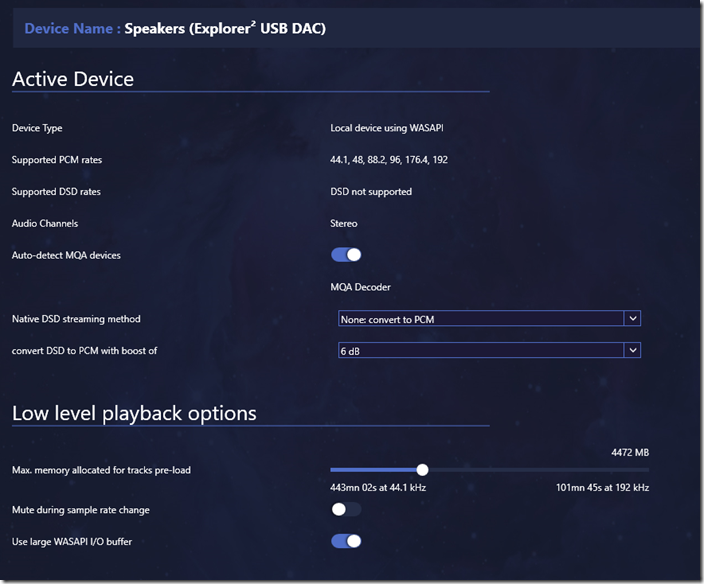 If the file is played through an MQA-capable DAC like the Meridian Explorer 2, I get a green light indicating MQA decoding on the DAC. If I play the “original resolution” version, I get a blue light indicating “MQA Studio”. WASAPI and ASIO support. 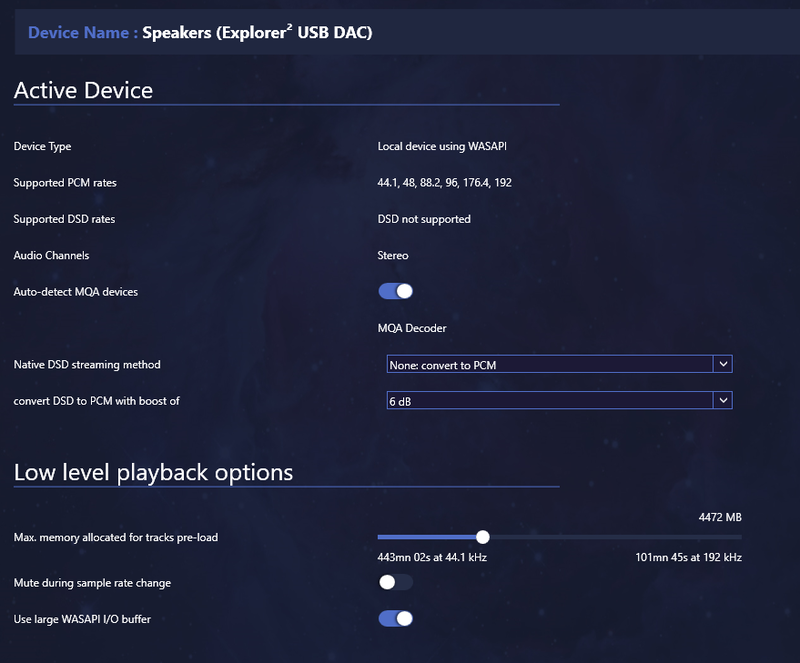 WASAPI is the native Windows standard which enables bit-perfect output and is aimed at professional audio engineers. ASIO is a standard with similar features developed by Steinberg. 3. A library manager which performs well with large numbers of tracks. I tried it with over 50,000 tracks and it was perfectly responsive. It uses the open source SQLITE database manager. 4. 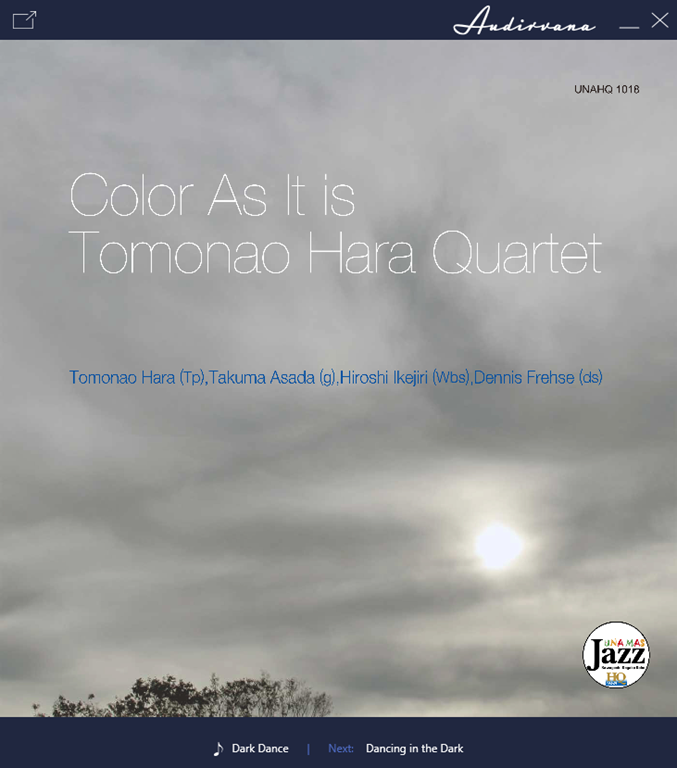 Hi-res streaming via Qobuz, HIRESAUDIO or Tidal. There is no support for the likes of Spotify or Apple Music; I guess these are not the target market because they use lossy compression. Not available yet, but coming, is a remote app for iOS (iPhone, iPad and iPod Touch), audio effects via VST plugins, and kernel streaming output. Audirvana is delivered as a download though it is a click-once application which means it updates semi-automatically, prompting you to update if an update is available. The user interface is, from the point of view of a Windows user, rather quirky. There is no menu or ribbon, but by clicking around you can find what you need. Some of the settings are accessed by clicking a gearwheel icon, others (such as the per-device options shown in the illustration above) by clicking an arrow to the right of the device name. There is also a compact view, obtained by clicking a symbol at top left, designed for playback once you have lined up the tracks you want. The current version seems unreliable when it comes to showing cover art in the library. Sometimes cover art shows up in the mini view, but not the full view. Searching the library is quick, but because the user interface is fairly blocky, you do not see many results on a page. An option just to show details in a list would be good (or perhaps it exists but I have not clicked in the right place yet). I can forgive all this since despite a few annoyances the user interface is responsive, the search fast, and playback itself works well. How much impact does the music player have on sound quality? This is difficult to answer definitively. On the one hand, the amount of distortion introduced by a sub-optimal player should be negligible compared to other sources of distortion. On the other hand, if you have gone to the trouble and expense of investing in hi-res downloads, streaming or DSD, it must be worth ensuring that every link in the chain does justice to those sources. 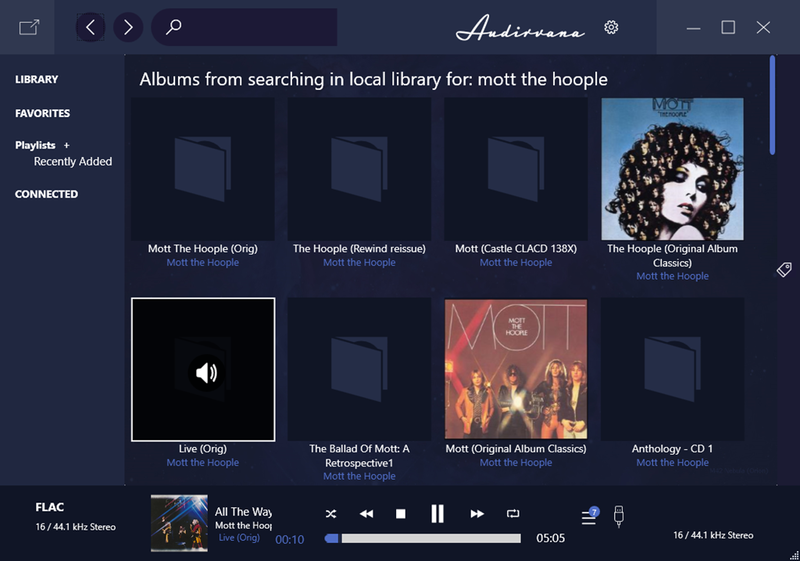 It is true that on Windows, with its enthusiastic technical audiophile community, most of what Audirvana does can be achieved with free players such as Foobar 2000 or VLC. There is also the excellent JRiver as an alternative paid-for player, though this lacks software MQA decoding (appreciating that not everyone likes or needs this). That said, the uncomplicated user interface of Audirvana Plus is great for audio enthusiasts who would rather not spend too much time fiddling with settings or plugins. Support for the iOS remote app is an unfortunate missing piece at present, and Android users miss out too. The Windows version needs a bit more work then (I also encounted some unpleasant noises when trying to adjust the volume within the application), but it does enough right to justify its relatively modest cost, and the bugs will fixed. Head over to the Audirvana site for a free trial. It is simple but appealing: one small box instead of all the clutter of a conventional hi-fi system. Orbtisound’s Dock E30 is also designed for today’s audio ecosystem. It supports wireless playback with Apple AirPlay, Spotify Connect, Android audio streaming over Wi-Fi, and also Bluetooth aptX and wired input via analogue or optical digital signals. There is an app for iOS and Android, and you can even dock your phone either by sitting it in the groove provided, handy for seeing cover art. You can also charge a phone using the built-in Qi wireless charging (as used by Apple), or by connecting a cable (not supplied) to a USB-C charging support. For wireless charging though you should lay the phone flat on the charging plate rather than standing it up. 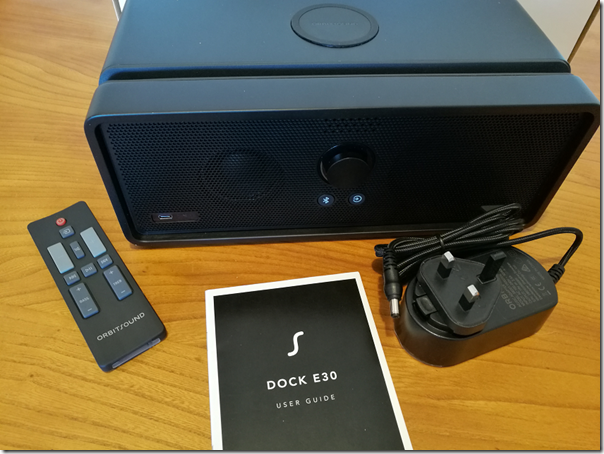 Wireless charging aside, this is all what you expect from a modern audio system; but the Dock E30 has something distinctive. This is the technology called Airsound. Orbitsound says that the problem with conventional stereo is that you have to sit in a sweet spot dead centre between and in front of the speakers to get a true audio image. “We have managed to overcome this inherent limitation in stereo by doing away with the idea of left and right channels,” says Orbitsound. What they have come up with, explained to some extent here and here, is a three-speaker system, where the sound of the main front speaker is modified by two “spatial” side speakers to give, it is claimed, a stereo experience wherever you sit. There is said to be a particular advantage when you have more than one speaker connected. Orbitsound’s explanation of Airsound is sketchy, to say the least, but it helped me to understand the results of my listening tests. 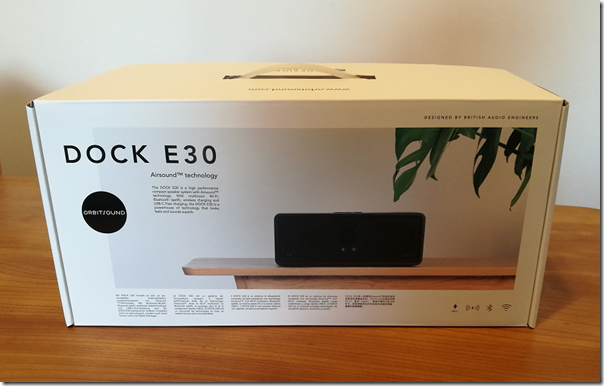 I set up the Dock E30 in my living room and tried it using various types of connection from both iOS and Android. For the main listening test though I settled on wired input for maximum consistency. I compared the E30 with several other speaker systems, including the slightly more expensive Sony SRS-X9 (now replaced by the similar SRS-X99). First impressions are good, with a powerful bass reinforced by the passive bass radiators on the back of the unit. The power output is not specified, but I got plenty enough volume for my smallish living room. I tried walking round the room and found a good consistency of sound, though frankly the SRS-X9 which uses conventional stereo speakers was also pretty good in this respect. How does the sound compare to that from the Sony? I found my notes contradictory at first. 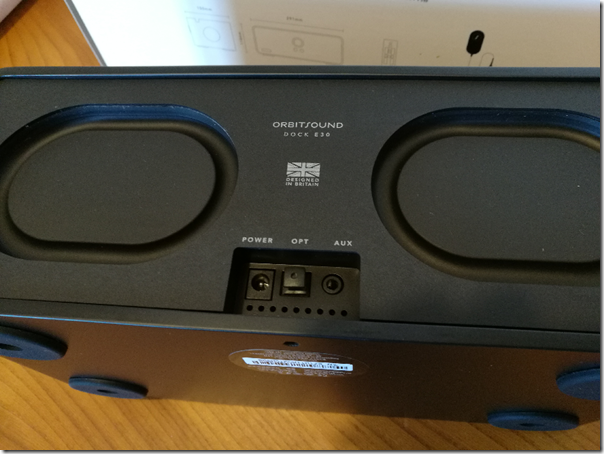 I felt the sound, while decent, was smoother and better defined on the Sony than on the Dock E30. At the same time, I could sometimes hear details on the Dock E30 more clearly than on the Sony. One example was the delicate guitar in the background during the intro to Steely Dan’s song Peg (which is beautifully recorded). It was more prominent on the Dock E30, even though overall I felt that the Sony had more clarity. Pondering Orbitsound’s claim of a true stereo image wherever you sit, I pulled out a handy test track, Paul Simon’s Cars. In the middle of the track there is a little stereo effect. “You can drive them on the left” comes out of the left speaker, then “you can drive them on the right” from the right. Then Simon resumes singing in a central position. I have to say, the Dock E30 made a complete mess of this effect. Bizarrely, the “on the right” vocal projected to the left of the image. On the Sony, everything was as it should be, so no, I had not got the channels reversed anywhere. Bear in mind that the Dock E30 only has one front-facing speaker; the other drive front-facing driver is a passive bass radiator. In the end this is all about processing. Orbitsound is trying to get a sense of room-filling stereo from a small box. It does this by munging the stereo signal into a mono part on the main speaker, supplemented by two spatial effects speakers that fire outwards from the left and right ends of the Dock E30, using some kind of algorithm that is not really designed to give you a true stereo image, but rather to create an illusion of depth. This I believe explains why I found the sound perplexing at times. Some details might be brought out more prominently, others not. You can adjust the Airsound effect by holding down mute for three seconds on the remote, then spinning the volume dial. If you adjust it for minimum Airsound, you get something close to mono. 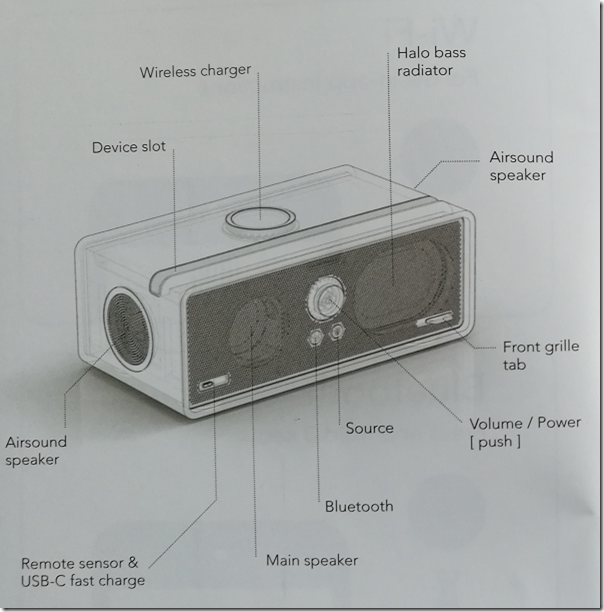 This is not a bad thing; I love my mono Squeezebox Radio. If you adjust for maximum Airsound, the sound become echoey and phasey, something which is not to my taste but might be an effect you enjoy. Setting Airsound to minimum is close, but I would like to see an option to disable it completely and simply have mono, though that would be rather a waste of three speakers. Listening to the stereo effects in Cars is an edge case. I found the Dock E30 enjoyable to listen to with music from classical to jazz to pop and rock. It has good bass extension, which can be excessive at times, but is easily controlled using the tone controls on the remote. Most people are not going to worry about the processing and can just listen. Personally though I am more purist. I favour a less processed sound and prefer the clean, honest clarity of a system like the Sony XRS X9. Leaving aside the Airsound debate, the Dock E30 offers good sound quality with exceptional bass for its size. The design is subjective of course, but while it is not objectionable, there are better-looking speaker systems in my opinion. The groove on top may trap dust, and the controls on the front are not beautiful. On the other hand, I am very happy with the flexibility of the unit. It has a generous range of inputs, both wired and wireless. The remote with its tone controls and mute button is excellent. The ability to charge your phone is a nice bonus. Unfortunately I am not convinced by Airsound or that this is the best use of three speaker drivers; but at the same time it is good to see some innovative thinking. I recommend that you audition before purchase. 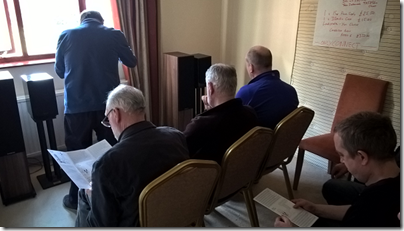 The Scalford Hi-Fi show is dead – long live the Kegworth “Europe’s biggest Hi-Fi enthusiasts show”? It was March 2009 when I took part in an unusual Hi-Fi show, variously known as the Scalford, Wigwam, Wam or Pie Show (Pie show because Scalford is near Melton Mowbray, home of the Pork Pie, and Pie rhymes with Hi-Fi). 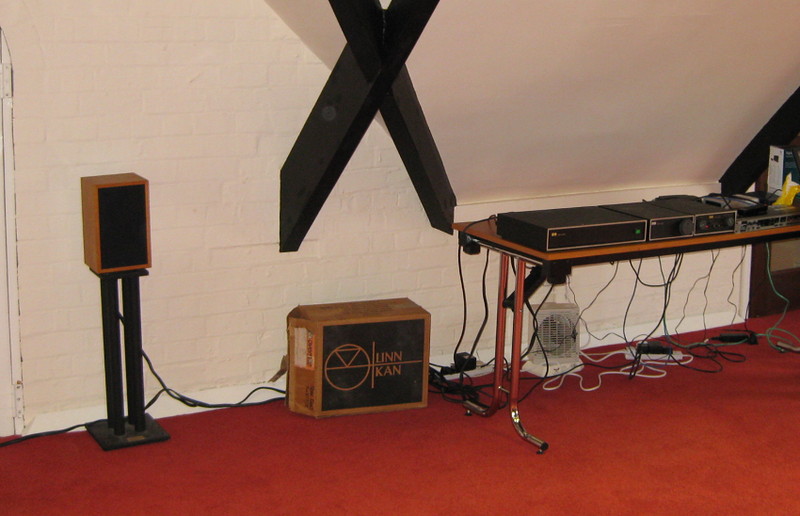 Wigwam was and is a Hi-Fi enthusiasts forum and the idea was to put on a show where the kit on show was not the latest stuff from big brands, but rather actual systems in use by enthusiasts. Without the normal income from commercial exhibitors, the cost of the hotel booking was met by the entrance fee (£10 as I recall). Exhibitor rooms were free other than a small contribution to public liability insurance. The early shows were run by audio show specialists Chester who did it, they said, as a community building exercise. Scalford Hall is an English country hotel which must once have been a grand country residence. it is beautiful, rambling and impractical, but full of atmosphere. 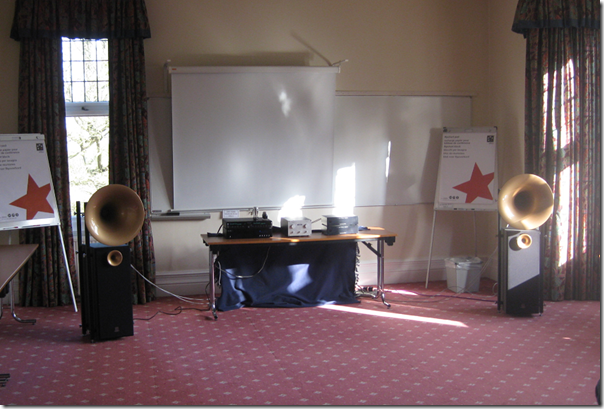 2010: Ergo speakers designed by James at another HiFi forum, Pink Fish Media, loaned to me for the event. Same source and amplification. 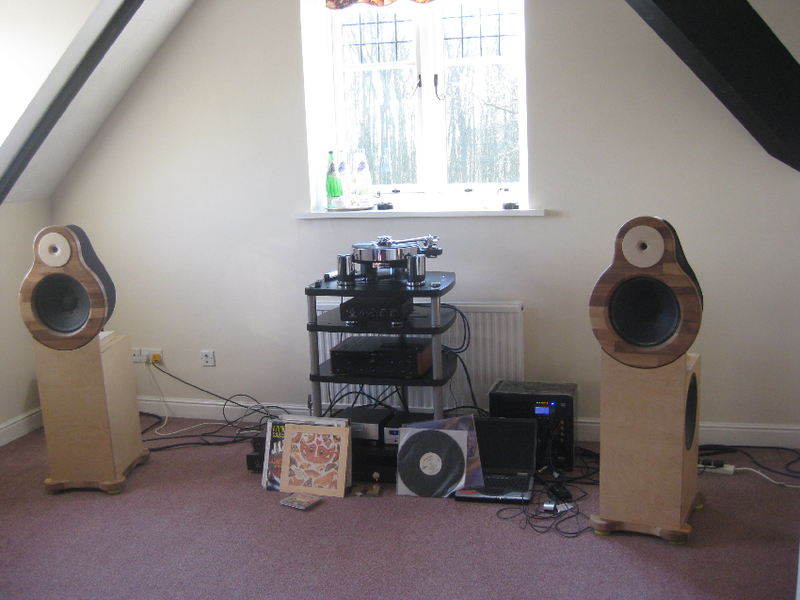 2012: Linn Kaber loudspeakers with Naim amplification; my least successful room I feel. I thought the Naim amplifier would get the Kabers sounding at their best but the sound was average and I was not sure how to fix it. 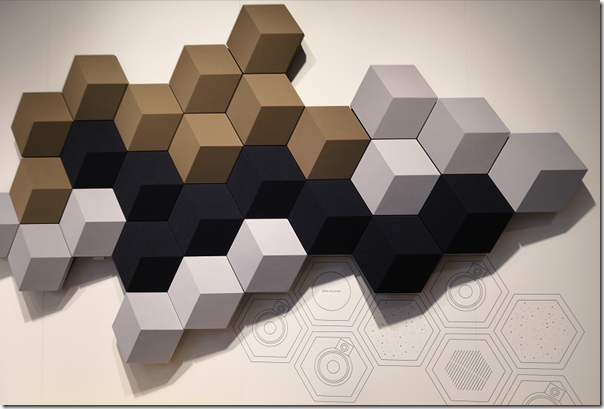 2013: Active Speakers Behringer B3031A. The theme here was how to get a great sound on a small budget, and the Behringer active speakers offer a lot for the price. This was fascinating; a modern budget amplifier compared to a classic pre-power combination loved by many but also considered coloured. Most thought both sounded great and were not sure which was which. Some of these events have separate write-ups on this blog. My goal was not to have the best sounding system but to do something interesting and enjoyable. Enjoyable it was, but also hard work – at first I didn’t bother booking a room for the night as I lived within 45 minute drive, but I gradually realised that staying over worked better both for access to the room and for hearing other rooms the night before. Heaving equipment around is no fun even though I didn’t have the heaviest stuff, even so amplifiers, subs and speaker stands are hefty enough. Some of my stuff got a bit bashed about too, though scratches rather than real damage. The earliest events were run supposedly at break-even or thereabouts by Chester. The only commercial presence in the early shows was a record shop in the lobby. I was personally fine with everything as we were doing something a bit different that would not otherwise be possible. Gradually more commercial rooms appeared and it became harder and harder to secure good rooms. My room in year 1 was brilliant and sounded great as a result. Many of the rooms though were small hotel bedrooms in an extension rather than the older part of the building, with poor sound insulation. It was hard to get a good sound in these rooms. I also began (speaking personally) to feel a bit unappreciated as it was the exhibitors who made the event worth going to, but we paid for the privilege and if someone managed to make some money (as I believe the organisers did in some years) none of it came to us not even a free beer or two. After the first couple of shows the organisation passed to the owners of the WigWam forum, which itself changed hands a few times. In 2017 my heart was no longer in it and I did not exhibit. 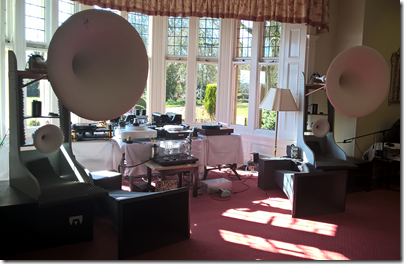 The trend towards greater commercialism continues and the WigWam’s current owners now promote the event as "Europe’s Biggest HiFi Enthusiasts Show". The cost for exhibitors has increased and now starts at £85. I have fond recollections of the show and hope it goes from strength to strength, but last year felt it was no longer for me. Scalford was a wonderful venue, quirky and romantic, visitors could still be surprised to open a door or ascend a stairway and find a corridor of rooms they had somehow missed. Of course it was also a bit impractical and the catering rather ho-hum but it wasn’t a big deal for me. The show is now moving to Kegworth, just off the M1 near Nottingham. The move to a hotel handy for the motorway and airport is another step away from the atmosphere and culture of the initial concept. That said, I have no doubt that it will remain a remarkable and unusual event and hope it continues to be a great success. I have signed up for a trial of the Tidal subscription service and have been listening to a few of the MQA-encoded albums that are available. You can find a list here. 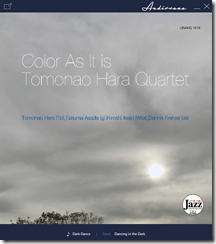 Most of the albums are from Warner, which is in the process of MQA-encoding all of its catalogue. From my point of view, having familiar material available to test is a huge advantage. Previous MQA samples have all sounded good, but with no point of reference it is hard to draw conclusions about the value of the technology. 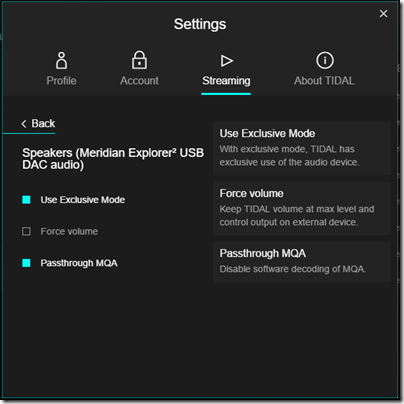 I have used both the software decoding available in the Tidal desktop app (running on Windows), and the external Meridian Explorer 2 DAC which is an affordable solution if you want something approaching the full MQA experience. Note that on Windows you have to set Exclusive mode for MQA to work correctly. When using an MQA-capable DAC, you should also set Passthrough MQA. The Explorer 2 has a blue light which shows when MQA is on and working. For these tests, I used the Talking Heads album Remain in Light, which I know well. This is pretty ugly; it’s compressed for extra loudness at the expense of dynamic range. This is nicely done in terms of dynamic range, which is why some seek out older masterings, despite perhaps using inferior source tapes or ADC. 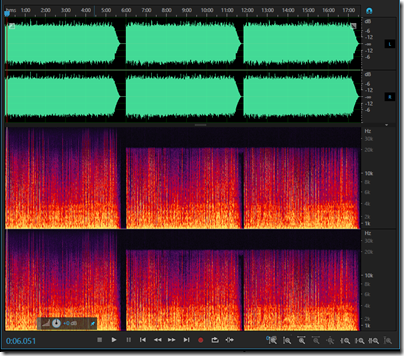 This image shows three variants of the track streamed by Tidal and captured via ADC into a digital recorder at 24-bit/96 kHz. The first is the track with full MQA enabled and decoded by the Explorer 2. The second is the “Hi-Fi” version as delivered by Tidal, essentially CD quality. The third is the “Master” version, in other words the same source as the first, but with Exclusive mode turned off in Tidal, which prevents MQA from working. You can see at a glance that MQA is doing what it says it does and extending the frequency response. The CD quality output has a maximum frequency response of 22 kHz whereas the MQA output extends this to 48 kHz at least as captured by my 24-bit / 96 kHz (the theoretical maximum frequency response is half the sampling rate). Do they sound different though, bearing in mind that we cannot hear much above 20 kHz at best, and less than that as we age? I have been round this hi-res loop many times and concluded that for most of us there is not much benefit to hi-res as a delivery format. See here for some tests, for example. MQA is not just extended frequency response though; it also claims to fix timing issues. However my captured samples are not really MQA; they are the output from MQA after a further ADC step. Of course this is not optimal but the alternative is to capture the digital output, which I am not set up to do. An interesting question is whether the captured MQA output, after a second ADC/DAC conversion, can easily be distinguished from the direct MQA output. My subjective impression is, maybe. The first 30 seconds of Born Under Punches is a sort of collage of sounds including some vocal whoops, before David Byrne starts singing. What I notice listening to the Tidal stream with MQA enabled is that the different instruments sound more distinct from each other making the music more three-dimensional and dramatic. The vocals sound more natural. It is the best I have heard this track. That said, I have not yet been able to set up any sort of blind test between the true MQA stream and my copy, which would be interesting, since what I have captured is plain old PCM. There is a key point to note though, which is that mastering offered by Tidal is better than any of the CD versions I have heard; the old Eighties mastering is more dynamic but sounds harsher to my ears. With or without MQA; you might want to subscribe to Tidal just to get these superior digital transfers. Update: it seems that the Tidal stream for Remain in Light (both MQA and Hi-Fi) is a different mix, possibly a fold-down from the 5.1 release. So it is not surprising that it sounds different from the CD. The question of whether the MQA decoded version sounds different still applies though. The MQA enigma: audio breakthrough or another false dawn? 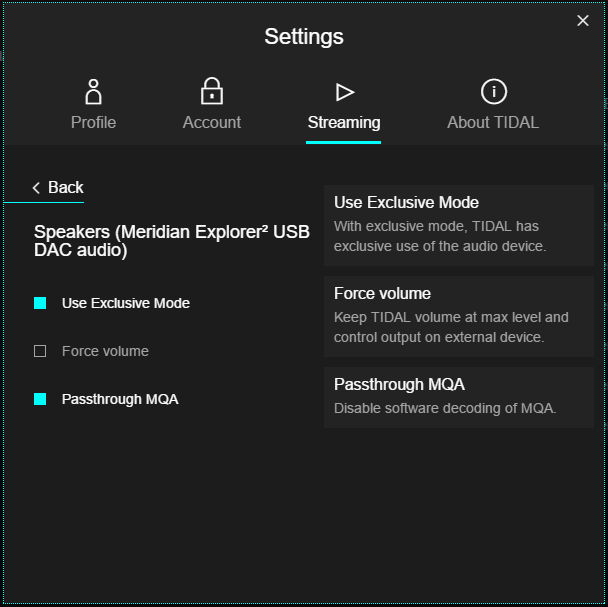 The big news in the audio world currently, announced at CES in Las Vegas, is that music streaming service Tidal has signed up to use MQA (Master Quality Authenticated), under the brand name Tidal Masters. MQA is a technology developed by Bob Stuart of Meridian Audio, based in Cambridge in the UK, though MQA seems to have its own identity despite sharing the same address as Meridian. Conventional audio formats discard parts of the sound to keep file size down, but part of this lost detail is the subtle timing information that allows us to build a realistic 3D soundscape in our minds. … With MQA, we go all the way back to the original master recording and capture the missing timing detail. We then use advanced digital processing to deliver it in a form that’s small enough to download or stream. MP3 brings you just 10% of what was recorded in the studio. Everything else is lost to fit the music into a conveniently small file. MQA brings you the missing 90%. There are two problems with this statement. One is that MP3 (or its successor AAC) actually sounds very close to the original, such that in tests most cannot tell the difference; and the other is that audiophiles tend not to use MP3 anyway, preferring formats like FLAC or ALAC (Apple’s version) which are lossless. 1. “Audio origami”: MQA achieves higher resolution than CD (16-bit/44.1MHz) by storing extra information in audio files that is otherwise wasted, as it stores audio that is below the noise floor (ie normally inaudible). There is a bit of double-think here as removing unnecessary parts of audio files is the sort of thing that MP3 and AAC do, which the MQA folk have told us is bad because we are not getting 100%. This is also similar in concept to HDCD (High Definition Compatible Digital), a technology developed by Pacific Microsonics in the Eighties and acquired by Microsoft. Of course MQA says its technology is quite different! Note that you need an MQA decoder to benefit from this extra resolution, and there is a nagging worry that without it the music will actually sound worse (HDCD has the same issue). 2. Authentication. 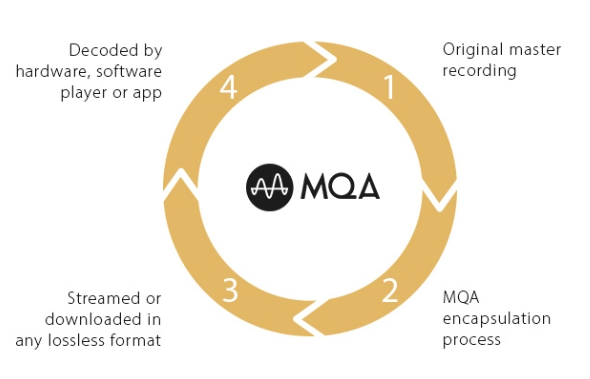 MQA verifies that the digital stream is not tampered with, for example by audio features that convert or enhance the sound with digital processing. This can be an issue particularly with PCs or Macs where the built-in audio processing will do this by default, unless configured otherwise. There’s a problem with digital – it’s called blurring. Unlike analogue transmission, digital is non-degrading. So we don’t have pops and crackles, but we do have another problem – pre- and post-ringing. When a sound is processed back and forth through a digital converter the time resolution is impaired – causing ‘ringing’ before and after the event. This blurs the sound so we can’t tell exactly where it is in 3D space. MQA reduces this ringing by over 10 times compared to a 24/192 recording. If this is an issue, it is not a well-known one, at least, not outside the niche of audiophiles and hi-fi vendors who historically have come up with all sorts of theories about improving audio which do not always stand up to scientific scrutiny. So is MQA solving a non-problem? That’s certainly possible; but I do find it interesting that MQA has received a generally warm reception from listeners. Have never really “done” digital before. 16/44 has always sounded ghastly to my ears right from the start and still now. MQA did indeed “fix” the various forms of distortion that I could hear present in everything where the sampling rate was taken down to just 44. … My findings – those of an improved sense of solidity in the stereo image and the lack of that horrendous crystalline glassy edge to things, especially on the fade, seem to be being mirrored in what people are hearing. It doesn’t have that thing I describe as a “choppy sense of truncation” which I suspect others mean by “transients”. Basically, per the post above, it’s a bit like “good analogue”. Digital can finally hold its head up high against an analog from master-to vinyl performance. And not only that, hopefully, walk all over it and give us something genuinely new. If this history of audio has shown us anything, it is that subjective judgements about what makes something sound better (and whether it is better) are desperately unreliable. Further, it is often hard to make true comparisons because to do requires so much careful preparation: identical source material, exactly matched volume, and the ability to switch between sources without knowing which is which, to avoid our clever brains from intervening and telling us we are hearing differences which our ears alone cannot detect. We should be sceptical then; and even possibly depressed at the prospect of a proprietary format spoiling the freedom we have enjoyed since the removal of DRM from most downloadable audio files. Still … is it possible that MQA has come up with a technology that really does make digital audio better? Of course we should allow for that possibility too. I have signed up for Tidal’s trial and will report back shortly. I am a tad conflicted when it comes to vinyl records. On the one hand, I have not seen convincing scientific evidence, or a properly conducted blind test, that demonstrates any reason why record replay is superior to digital, while there is plenty of evidence for the reverse. On the other hand, I put on a well-mastered record, and it is like magic, I am transported into the music in a way that my digital sources rarely achieve. Plus the sleeves are beautiful, and in the case of older recordings, a sense that this is the real thing and subsequent formats mere copies (even if they do sound better). Finally, sometimes missing or damaged master tapes, or the bad habits of the recording industry in compressing CD audio so that it is uniformly LOUD, mean that records sometimes really do sound better, despite the limitations of the format. If you like the sound of records but the convenience and security against damage that digital offers, you might want to rip them. I have done this but would not describe it as easy. You have to play the record in the closest to ideal conditions you can manage – clean record, no dust accumulated on the stylus, high quality turntable and phono stage – while also recording the output through an analogue to digital converter (ADC). Then when done, you have to break the result into separate tracks and tag it correctly. There is software to assist this whole process, like Channel D’s Pure Vinyl, but it is never that quick and easy. There is also the question of how much to tinker with the results in the hope of improving it, via click removal and the like. Personally I tend to the view that most things risk making the sound worse, but there is certainly a case for it, especially with particularly intrusive scratches. 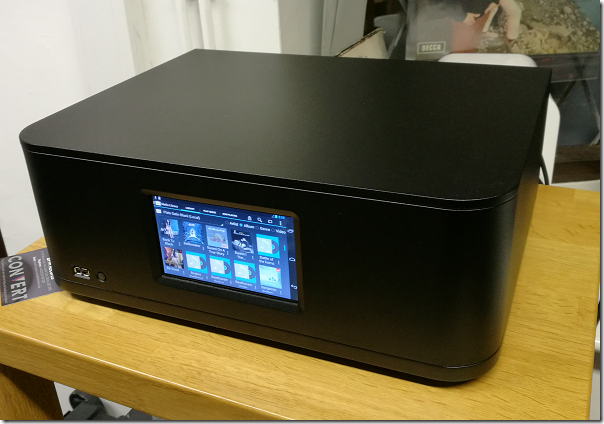 Last week I went to a demo of Plato, a system for ripping vinyl combined with an all-in-one home media playback solution. It comes from the Derby-based company Convert Technologies, formerly known as Entotem. The company has also launched the Red Dot recording service, through which you can get them to rip vinyl or even CDs on your behalf. The company showed me its top of the range unit, which is an all-in-one box for storing digital media as well as playing it, and includes a power amplifier which delivers, they say, 25W Class A amplification or 50W Class B. The idea of Class A/B amplification is not new so I am not sure whether there is any secret sauce in the Plato design; however the company also offers a Class B version at a considerably lower price. The system runs Android customised for the purpose, with a touch screen. There is also a controller app which works best on Android but is also available for Apple iOS with “approx 70% of the functionality”. It includes an ESS Sabre 32 DAC and ADC. Inside is a beefy toroidal tranformer powering the various boards. Around the back is a generous set of inputs and outputs, including MM/MC phono input, 3 additional line inputs, 1 coax and 3 optical digital inputs, 2 optical digital outputs, 1 HDMI output, and 3 USB 2.0 ports. The digital format can be set up to 24-bit/192 kHz. You can pay extra for SSD storage which is pretty pointless from a technical point of view (SSD is much faster, but a conventional hard drive easily fast enough for audio recordign and playback) but would lower the noise level slightly, though the fan is likely to be louder in any case. Having all the controls functions driven by software enables plenty of features. You can change the phono input from moving coil to moving magnet, vary the capacitance and resistance, and apply a rumble filter, for example. Ripping vinyl is a matter of pressing a red button (hence the name of the ripping service). When the audio is played, there is an analogue chain for listening, I was told, but also a “parallel digital path” which captures a sample of the audio and sends it to Gracenote, an online tagging service, for recognition. If you are lucky, you will get the metadata and album artwork automatically retrieved. The system will also separate the tracks for you, taking most of the drudgery out of the ripping process. The system does not attempt any click or noise reduction. “We have looked at it, because we write all the software, but most people said ‘don’t do it’,” said Pete Eason, Customer Experience Manager. “It’s not a priority”. You can export the files to USB storage, so you could do your own additional processing if you wanted. However there is an annoyance: the agreement with Gracenote prohibits the export of the album art. So if you export your files for playback on a phone, for example, you don’t get the art. That’s irritating and there is talk of switching to another metadata supplier to fix it. The system will stream music from attached USB storage, or over the network using UPnP. I am not a fan of UPnP because it seems less amenable to search, and less reliable, than other systems such as Logitech Media Server, but it should work OK. Internet radio is also provided, via the TuneIn service. However you cannot access Plato’s storage directly over the network. This makes me wonder if Plato’s engineers would have been better off using Linux rather than Android for their embedded OS, as that would make this trivial to implement. There is no support for Spotify Connect, which is a shame. You can of course stream to the unit from a phone or laptop using a device such as Google ChromeCast but that is not the same thing, since the quality and consistency of the signal is limited by your phone. The Red Dot ripping service sounds good for those with plenty of money and little time, especially as it includes a cleaning service, but it is expensive at £10.00 per album and a minimum quantity of 25. Note you could buy the CD for less in many cases. There is also a limitation in terms of the playback equipment used. It would be too expensive to use a true high-end cartridge and stylus. Red Dot uses “a really decent Pro-Ject Debut Carbon turntable and Ortofon stylus,” according to the FAQ, though they talked about other possible turntables, but always mid-range. That may not equal the equipment you have at home. I got to ask some awkward questions. Why would anyone want to rip their vinyl, when with Spotify or Apple Music you could just play it from internet? Well, it will not always be a pristine original, but it will always be the same as when it was ripped. I am not personally convinced that the law is so clear-cut. My records all say “unauthorised … copying of this record prohibited” and “all rights reserved”. On the one hand, there is the question of whether even personal format conversion of a record is strictly legal (though I cannot imagine anyone being pursued for it). On the other hand, since the record represents a personal license to enjoy that particular recording, I am not sure that whether you get back a copy of your record or someone else’s makes any difference. Red Dot also offers to rip CDs, and here the argument seems even more ridiculous. Since ripping a CD with identical mastering results in an identical file, it would be absurd to re-rip when you already have the file in question. Are LPs any different, even though the imperfections of the format mean that every rip will vary slightly? Next question: is there a paradox at the heart of this operation, which is that people who love records believe that the analogue chain sounds better than digital, so they are unlikely to want a digital copy? And if they do, why not just buy the digital version? “We’ve got the best DAC in the industry, which is the Sabre DAC,” added Timberley. “If you are going to convert it we’ve got the best piece of kit to do it.” Though I think he meant ADC rather than DAC. I also suggested that retailers might prefer to buy their own Plato and offer a ripping service, rather than resell Red Dot. Dealers are “too busy” said Timberley, though they might look a a licensing restriction if it became an issue. This is not a review and I have not had a chance to try this at home. If you seriously want to rip your vinyl (and I do think there could be good reasons, as I stated above, though hearing pristine pops and clicks is not one of them), then Plato looks like a convenient though expensive choice. As an all-in-one hi-fi (just add speakers) Plato might also be good, though it looks expensive compared to, say, a NAS, a Raspberry Pi with a DAC, and a decent amplifier. It is hard to value these things without trying them out though. In the end though, my instinct is that the best way to play records is to play records. I haven’t found record wear much of a problem, especially when you have a large collection. So I am not sure that Plato is for me, though it does look nice and easy to use. The Wigwam Hifi Show is an unusual event, in that most of the exhibitors are not vendors with their latest and shiniest, but enthusiasts showing off their own systems. It is a lot of fun, with plenty of exotic and/or old equipment that you will not see or hear elsewhere. I have exhibited at the show in the past, and try to do something a little different each time. This year I thought it would be interesting to contrast the many multi-box and expensive systems with something at the other end of the scale. 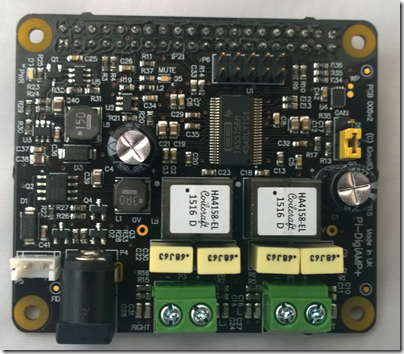 I was impressed when I reviewed the IQAudio Pi-DigiAMP+ for issue 36 of the MagPi magazine, so I took it along. 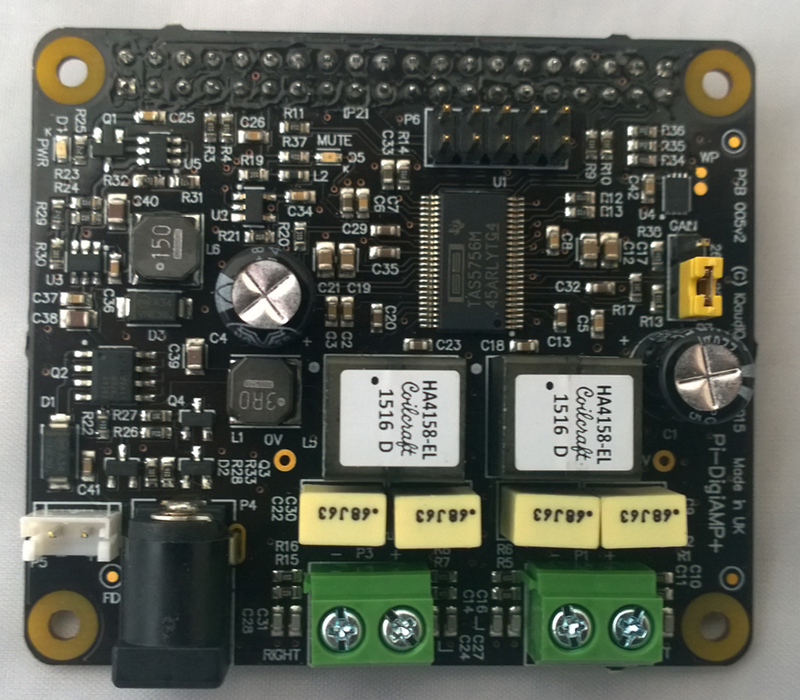 This unit is a board that plugs in on top of the main Raspberry Pi board. 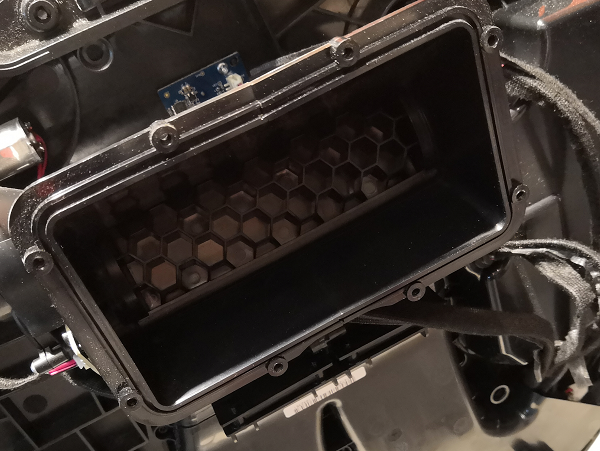 It is very simple, the only external connectors being power in, and left and right speaker terminals. It includes a DAC and a class D amplifier, based on the Texas Instruments (TI) TAS5756m chipset. The DAC is based on a Burr-Brown design. I assembled my unit using a Raspberry Pi 2, the above board, and the matching case and power supply from IQ Audio. The power supply is the XP Power VEF50US15 which means I get up to 2x20w; if you use a VEF65US19 you can get 2x35w (both available from the IQAudio site). Here it is in the room at Scalford Hall, home of the Wigwam event. The speakers shown are the Cambridge Audio Aero 6, though we also had a pair of Quad 11L and tried them both. The way things work at this event is that you sleep in your room the night before, and the next morning the bed is removed and it becomes your exhibition room. Having tried the system with the bed in place, I was distressed to find it sounding markedly worse (bloated bass) once the bed was removed. 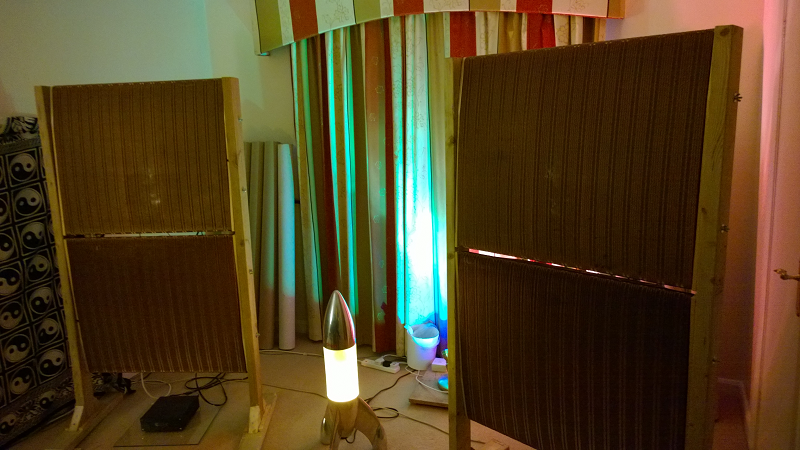 With no time for proper experimentation we dragged the mattress back out of the cupboard and leant it against the wall, which improved matters; we also used foam bungs in the speaker ports to tame the bass. Not ideal, but shows the difficulty of getting good sound at short notice in small hotel rooms. 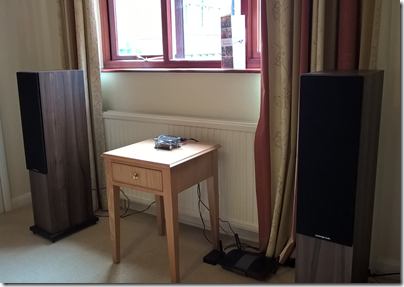 The Cambridge Audio Aero 6 speakers I would describe as a good budget choice; they sell for around £350. Philosophically (as with the Quads) they are designed to be clean, detailed and uncoloured. 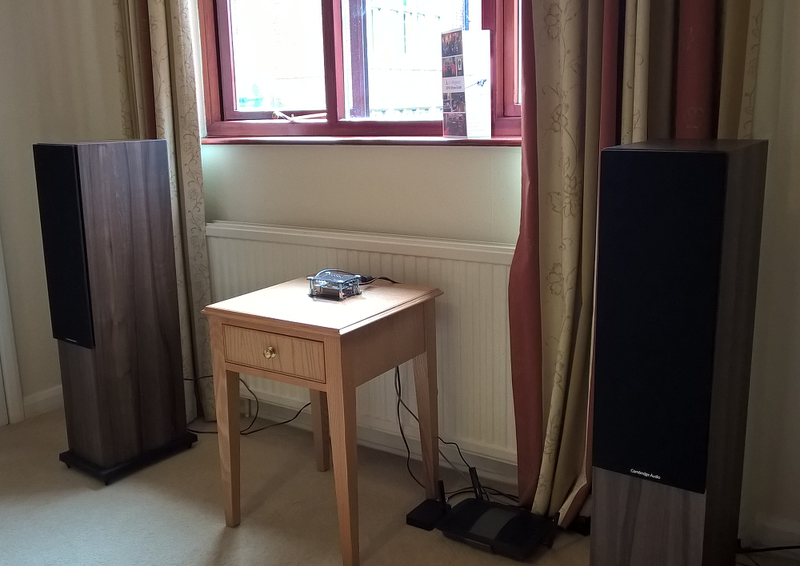 The choice of floorstanders rather than small standmounts was deliberate, as I wanted to demonstrate that using a tiny amplifier does not necessarily mean a small sound. Having said that, we also put the Quads on from time to time, which are small standmounts. The sound was not radically different, though bass extension is less and to my ears the 11Ls are a little less precise than the Aeros, with a warmer sound. I preferred the Aeros but as ever with loudspeakers, tastes vary. If I were buying today, I would recommend the new Raspberry Pi 3 and the more powerful 19v power supply which increases the cost by about £10.00. So that is between £125 and £135 for the complete device, and then whatever you choose for the speakers. For the demonstration I brought along a router with wi-fi, to which I attached a hard drive with lots of FLAC files ripped from CD, along with a few high-res files. The router lets you attach a USB drive and share it over the network, so I configured Volumio on the Pi to use that as its source. In a typical home setup, you would probably store your music on a NAS device and use your existing home network. There was a steady stream of visitors from around 10.00am to the close of the show at around 17.00. The goal was not to be the best sound at the show, but rather to be the smallest and still deliver decent sound quality, and for many visitors I think we succeeded. We stuck the equipment list on the wall and lots of people photographed it with the intention of looking into it further. A demo under way: spot the mattress leaning against the wall and the smaller Quad speakers alongside the Cambridge Audios. A number of visitors knew of, or were even using, a Pi for streaming, but the idea of having the amplifier included on a small board was less familiar; it was fun when people asked where the amplifier was, or whether the speakers were active (they are not). Some were really astonished that you can get respectable sound quality from such a small box. Volume was more than sufficient for a room this size and frankly plenty for most home situations though of course not for huge rooms or loud parties. Note that despite playing loud throughout the day the amp board did not get warm at all; this is because a Class D design delivers almost all the power supplied as output to the loudspeakers. 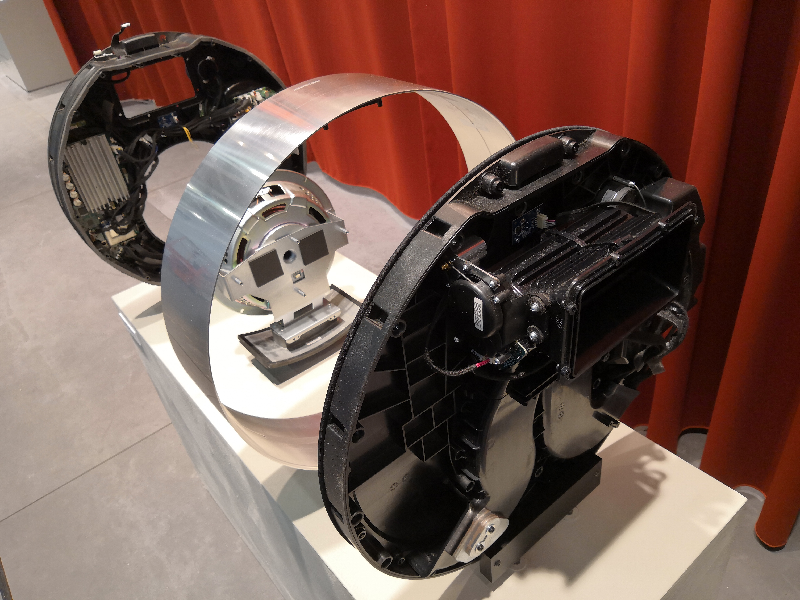 I was glad to see and hear the French Devialet Phantom system at the Mobile Focus event in Barcelona, just before Mobile World Congress, having missed the company’s recent presentation in London. The Phantom is a device that looks like a giant eyeball, and is essentially an active mono wireless DAC and speaker. There are two models, the Phantom which delivers up to 99dB at 1 metre and costs €1690, and the Silver Phantom which delivers up to 105 dB at 1 metre and costs €1990. There is an optional Dialog unit at €299 which is a wi-fi router that creates a private network for the Phantom as well as supporting a guest network designed for music sharing. A Dialog can also control up to 24 Phantoms and is necessary for multi-channel; obviously for stereo you need at least two. An app called Spark runs on iOS, Android or Windows (not Windows Phone) and handles playlists as well as visualising music. 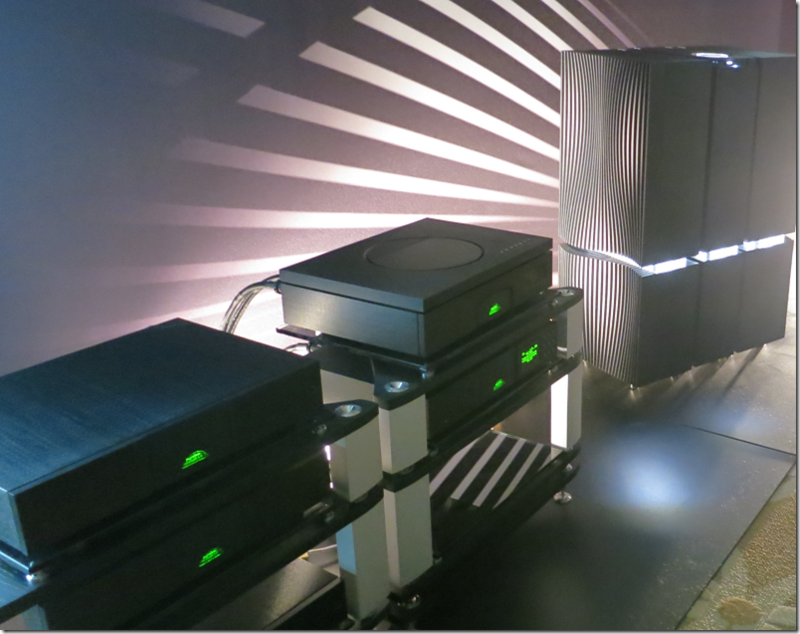 Each Phantom has a midrange unit, a treble unit, and two woofers. It measures 253 x 255 x 343mm and weighs 11 kg. My encounter with Phantom did not get off to a good start. I am allergic to misleading jargon, and the pitch the Davialet representative made to me was confusing to say the least. “Digital chops up the sound,” he told me; but with hybrid technology Devialet was able to reproduce the purity of analogue sound. I observed that every DAC in the world is able to decode digital formats to analogue sound, and we had some difficulty progressing to what exactly is different about Devialet’s approach. The case for the Phantom is not helped by the over-the-top language in the brochure, which modestly claims “the best sound in the world” and under a heading “IN TECHNICAL TERMS” promises Zero distortion, Zero background noise and Zero impedance. The system was playing Hotel California by the Eagles when I was there. I know the sound of this album well and it sounded boomy and unpleasant, though it is difficult to get good sound on a stand in a busy exhibition so I make generous allowance for that. I did get a copy of a white paper which offers a bit more information. There are several technologies involved. 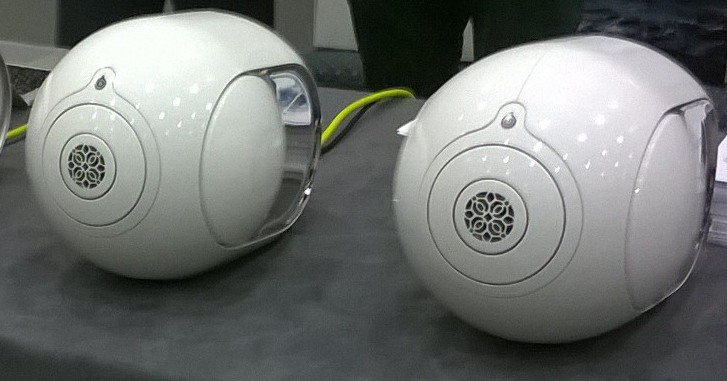 The first is what Devialet called ADH (Analog/Digital Hybrid). 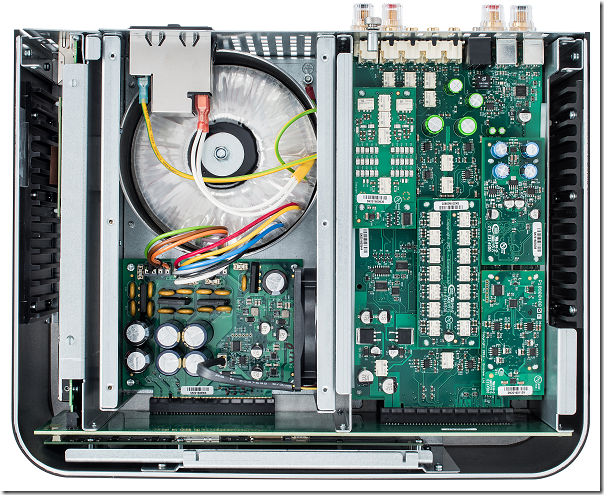 This combines class A amplification with the efficiency of class D. The way Devialet puts it is that several class D amplifiers act as slaves to the class A amplifier, so that the class D amplifiers provide the power while the class A amplifer the control. 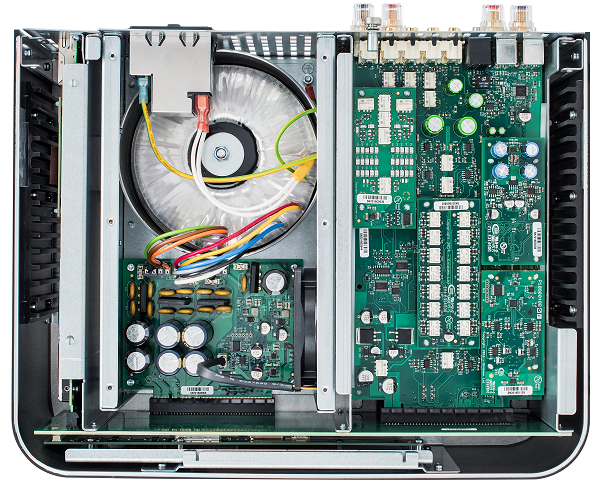 A Texas Instruments PCM179x DAC is positioned next to the amplifier to minimise any loss between the two. A third feature has the name HBI (Heart Bass Implosion). This tackles the tricky problem of reproducing deep bass with a small enclosure. The idea is to use a sealed box design for high efficiency at the lowest frequencies, a driver with long 26mm excursion (the difference between the foremost and backmost position of the driver) in order to move more air, and to use two symmetric drivers to cancel mechanical vibrations. 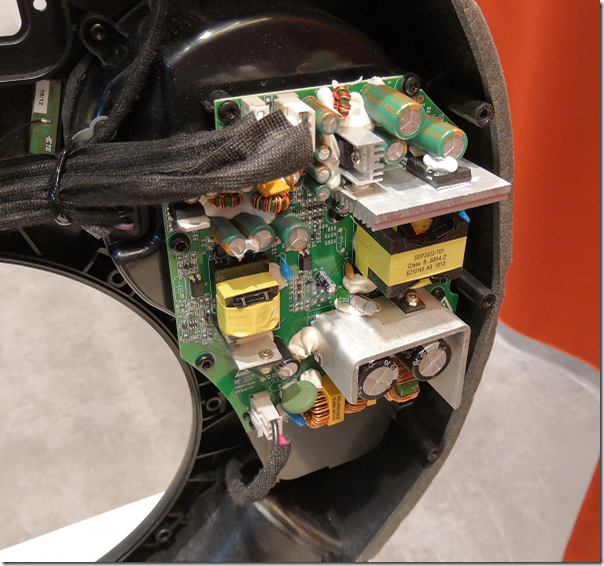 This does result in high maximum air pressure inside the enclosure, up to 174dB SPL according to Devialet’s paper. Most drivers collapsed in this environment, so Devialiet designed its own woofer. 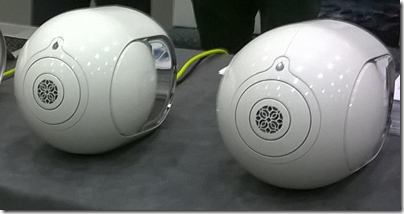 Finally Devialet’s engineers figured that a sphere is the ideal shape for producing sound without “diffraction loss”. The result, according to the specs, is 16Hz to 25kHz +- 2dB, and 20Hz to 20kHz +- 0.5dB which is impressive for a speaker system. The problem with such measurements is that they typically taken in an anechoic chamber whereas actual listening rooms have all sorts of resonances that result in a much less accurate sound. Does Devialet’s Phantom system sound as good as a more traditional system at its price level? That is the question which interests me; if I get an opportunity to try it out I will be sure to report back.